The OPUS (Oral Peptide Utility System) is our technology to orally (sublingually) administer peptides which have no immunomodulatory mode of action. Our lead products are oral GLP-1 analogues (liraglutide and exenatide) for treatment of diabetes type II, obesity and "pre-diabetes". The figure below demonstrates that our sublingual formulation (SL) (Group 2) very closely matches the effectiveness of subcutaneous (SC) (group 3) exenatide in modulating blood glucose levels in diet-induced obese (DIO) mice. 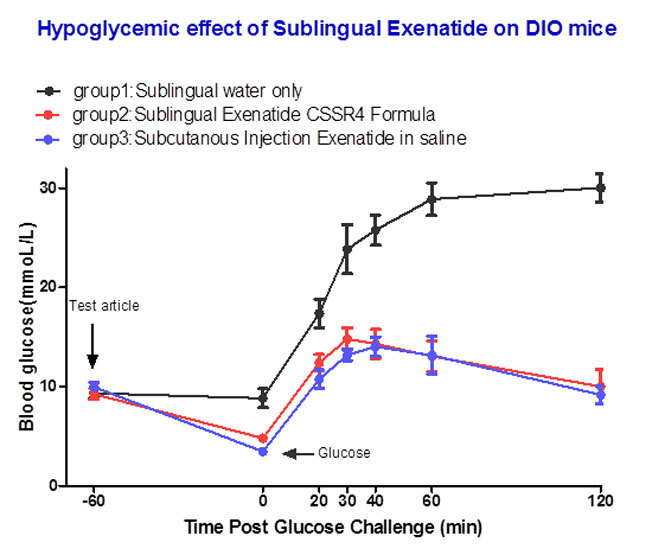 Figure : Pharmacodynamic effect of sublingual versus subcutaneous exenatide on blood glucose, following glucose tolerance test in DIO mice. A second example is the effect of sublingual liraglutide as compared to injectable liraglutide. 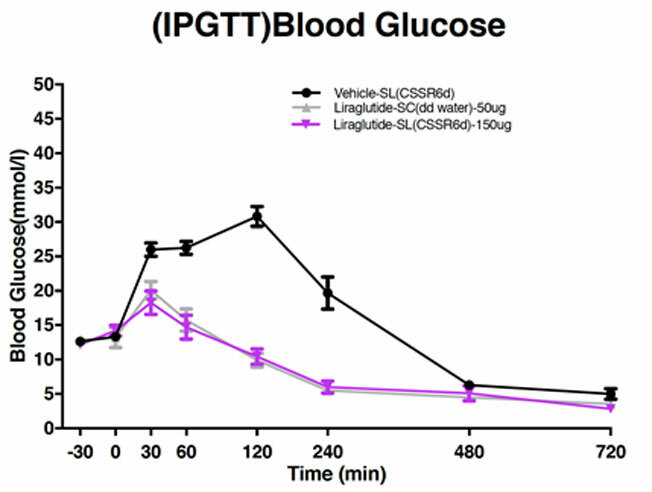 Figure : Pharmacodynamic effect of sublingual versus subcutaneous liraglutide on blood glucose, following glucose tolerance test in DIO mice. Another example of an application of the OPUS technology is the development of a unique "Insulin Plus" formulation. BioLingus' sublingual "Insulin Plus" (sublingual Novolog formulation) mirrors the effect of 1IU SC Novolog. Our oral formulation mitigates the risk of unacceptable variations in insulin, which could be expected in an oral formulation. Figure : Pharmacodynamic effect of sublingual versus subcutaneous insulin+ on blood glucose, following glucose tolerance test in DIO mice.